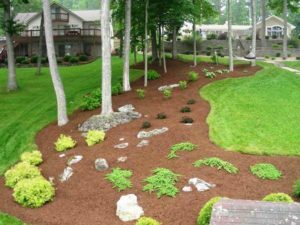 Mulching is a very important practice for establishing new plantings, because it helps to conserve moisture in the root ball of the new plant until the roots have grown out into the surrounding soil. The growth rate and health of trees and shrubs increases when there is no competition for water and nutrients from weeds. Mulch also helps to prevent tree trunk injury by mowers and trimmers. Mulch entire beds of shrubs, trees, annuals, herbaceous perennials and ground covers.